A Tube Overview – What’s the Best Tube for Your Product? There are several kinds of collapsible tubes including: plastic, laminate and aluminum. Each tube has its own unique properties and manufacturing process. Global Pack Source is here to help you choose the best tube for your product. Plastic tubes can be made of LDPE(Low-density polyethylene), MDPE(Medium-density polyethylene), HDPE(High-density polyethylene) and EVOH(Ethylene Vinyl Alcohol Polymer). Produced using the extrusion process, plastic tubes are available as either mono-layered or multi-layered . A “Sleeve” is produced from virgin resin and colorant on an extrusion line. The tube “Sleeve” diameter and length are determined by the extrusion equipment. Once the “Sleeve” is produced, the tube head is fitted using an automated heading machine. Next, the tubes are printed, using specialized machines for offset and silk screen printing and finally are coated with a glossy or matte varnish. After printing, the tubes move on to the capping line and are finally packed our for shipping. Due to the improved barrier properties of multi-layer plastic collapsible tubes, the use of this type of tube has exploded in the last decade. The improved production now makes Plastic Collapsible Tubes a great choice for a wider range of products, such as food and pharma. Like plastic tubes, laminate tubes can be made in a variety of substrates. Foil laminate collapsible tubes (ABL) is the #1 barrier layer tube. ABL tubes have an extraordinary Oxygen Transmission Rate (OTR) and Water Vaper Transmission Rate (WVTR) properties. ABL tubes have a layer of aluminum in the tube wall. Plastic Laminate Collapsible Tubes (PBL) have a barrier of EVOH in the tube wall. PBL tubes provide great graphic opportunities and outstanding barrier properties. Additionally, PBL tubes retain their shape for the life of the contents. Next is the All Plastic Laminate Collapsible Tube (APT). Similar to a PBL tube, APT tubes retain their shape and offer CMYK decoration and are quite economic. Finally, Poly-foil Laminate Collapsible Tubes are foil laminate tubes that are finished with an external layer of LDPE plastic. 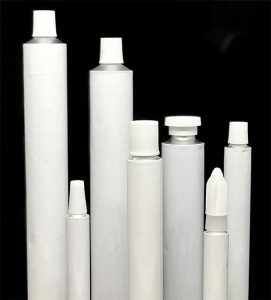 Many reflective cosmetic tubes are made from poly-foil. Aluminum tubes are created by taking aluminum slugs and loading them into the press feeding device. The slugs are pressed between the puncher and the die for impact extrusion. The impact pressure forms the tube shoulder and body. The tube is then moved to the trimming machine, where it is cut to the desired length. Next, the tube neck is threaded. The next step is the annealing process, which softens the metal, making the tubes collapsible. Then the tubes move to the internal lacquering stage which creates an inner coating. This coating prevents the tube contents from reacting with the aluminum, allowing the tubes to be filled with almost anything. Next, the tubes move to the printing station. The first process is the base coating machine, which applies a layer of based coat on the outside of the tube. The coated tubes are dried and moved to the print station. Aluminum tubes are available in different base coat colors accented with offset printing. Finally, the tubes are capped and packed for shipment. Aluminum tubes are traditionally used for pharmaceutical and industrial use, as well as for artist paints and have recently seen a resurgence in the cosmetic industry where brands are looking for a retro look. Regardless of what type of product you have, Global Pack Source has the perfect tube.